Today we are interviewing John Williams about his sci-fi novel, "Wormhole Moon." I am a aviation professional by night and an author by day. I work on writing and promoting the ten books I have published so far. I love to interact with my readers and reading their comments. I am also in the process of completing a book publishing course, soon to be released. 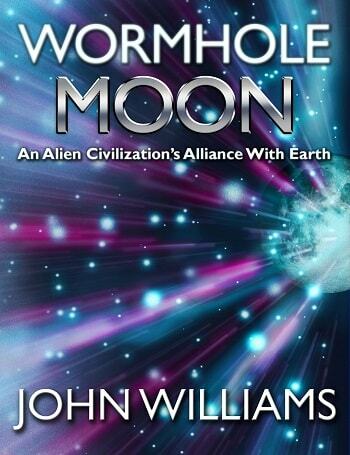 Describe the plot of your book, “Wormhole Moon,” in a few sentences. Its a Sci-fi book that will appeal to those who may not often read science fiction. Its born from a lot of great research and has many international locations. It will take the reader on a true literary rollercoaster ride. What inspired you to write a novel about two astronauts who play a pivotal role in developing an alliance between Earth and an alien civilization? I like the underdog. I like see a story were people who have a dream and are thrust into circumstances that would cause them to rise to the occasion of doing what would seem to most, impossible. Tell us a bit about the two protagonists. Steve Willory, Commander: A Naval Academy graduate a strait shooter but not ignorant of protocol and the ways things work. He's in his mid 50’s, married to his wife Jean for 21 years, and has three girls. He's a team player and focused on the mission. He has the ability to lead teams well but he likes to stay in the action. He's Mr. Dependable. He retired from the U.S. Navy after 30 years. He has a dream to become a statesman. Deon Stryker, Major: Co-pilot, former U.S. Air Force fighter pilot. At 31 years old, he is probably the youngest major, with a line number for Lieutenant Colonel, in the Air Force and certainly the youngest pilot in the program. He is also a martial art enthusiast, who is highly skilled with the Chinese Jian. Did your experience in the aviation industry influence how you wrote the technologies in this book? Absolutely. As an FAA certificated Aircraft Mechanic and former Air Force Flight Engineer, I am very familiar with cockpit procedures and the technical aspects of aviation. I also have been always fascinated with space and space travel. The combination of these skillets enabled me to add the kind of detail a novice to aviation could not. One of the unique things about your sci-fi novel is that it is very approachable, even for non-sci-fi readers. What steps did you take to make the book so approachable? Having read a number of science fiction novels myself, I could understand why a non sci-fi reader could be frustrated with the genre, so I began with the end in mind. I effort to add enough tech jargon to satisfy savvy readers, yet briefly explain the same to those who were not for better reading clarity. Sure, Tom Clancey, Frank Peretti and John Nace to name a few. I use an outline to navigate the story to an expected end. It keeps me on road and helps me with story continuity, especially when writing a series. I start with bullet points at high-level. I then break them down into smaller pieces and create chapters. This is where I flesh out the story characters, etc. At the same time, I create what I call a “Character Matrix & Glossary.” This lists all of the characters, their description, roles and responsibilities and miscellaneous assorted information, quirks, habits, etc. The “Glossary” contains specific alien words and names. Again, this help immensely with continuity from book one to book three an beyond. Once finished, I read the text probably 30-40 times before giving it to my editor. I love it. I try to carry a book with me. With the onset of ebooks, I can carry one hundred or more. First, I want to become a full-time author. I would also like to develop more sci-fi stories. Finally, I would like to license my books for film. That would be very exciting for me indeed. Not really. The writing is the fun part. Its the promotion of the book and such that takes more of my time than anything else. If I’m to sell books, it comes with the territory. I’m currently entering chapter three of “Wormhole Moon II.” It’s looking like an great sequel to the first book. I have planned three books so far. Once the last book is completed. I will likely refocus on the book publishing course that I started on before the “Wormhole Moon” series. I explain the process that I use to publish books, and get traffic to them. The book is very entertaining and a pleasure to read. It is the first book of three so look for the second one to come out mid to late next year. Additionally, readers may influence the direction, or some of the character storylines of the second book if they send me their comments to: info@wormholemoon.com. As they approached the great building, a crowd of aliens who seemed very excited had gathered in front. The entrance was magnificent. Colorful foliage adorned the building and doormen were posted in front like soldiers. The transport stopped and the door opened. Aioli exited and communicated with three other aliens who approached the vehicle as if they were expecting the arrival. She motioned to the astronauts to exit the transport and lead the way into the building. As they entered the building, Aioli waved off the approaching hotel staff holding drinks, alien h’orderves, some which moved, and personally walked the astronauts through the entrance toward their new accommodations. As they walked through the enormous lobby, there were singers, musicians and dancers. The music was unlike anything they ever heard on Earth. The dancers would leap high into the air as if they were flying and gracefully land as if gravity had no meaning. Lights were streaming through the air back and forth like luminescent liquid and would change color and movement in relation to the music they played. Aliens would pause to look at the human astronauts as they were going about their business. Large alien birds with colorful translucent wings, would occasionally fly from one side of the great lobby to the other. It was quite a spectacle. Very high walkways with no railings crossed the lobby and lead to other adjacent buildings. Aliens with elegant flowing robes and colorful attire where everywhere. They would pause and look at the strangers as they walked. Aioli continued to walk confidently as if leading a parade and passed a bank of elevators of light and walked to a separate bank of two seemingly private elevators. The door opened and we all entered. As they arrived to the floor, they walked out into what seemed like an endless hallway with no doors.